You get all the important elements right here in a 19” form-factor. 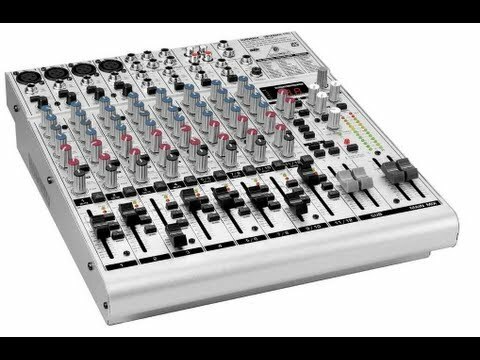 This compact console offers 12 balanced high-headroom line inputs, 4 INVISIBLE MIC PREAMPs (IMPs), 2 aux sends per channel (1 pre/post fader switchable for monitoring/FX applications and 1 post fader for internal FX or as external send). You also get an effective, extremely musical 3-band EQ with semi-parametric mid band plus switchable low-cut filter on all mono channels. The integrated 24-bit digital stereo FX processor with 99 great-sounding VIRTUALIZER presets includes reverb, delay, chorus, compressor, tube distortion and others as well as a 1 kHz test tone generator. There are 2 subgroups with separate outputs for added routing flexibility and 2 multi-functional stereo aux returns with flexible routing.